With a driver waiting for you at the curb when you arrive at San Antonio International Airport your trip will feel much more manageable. You can make reservations for discount taxi services and airport shuttle rides from shared ride to private vans ahead of time to make things easier. Our limo and sedans are a black car service offered for those looking for a chauffeur to assist them throughout their ride. You can also charter a bus or minibus if you will have a larger group. If you’re in town for a trade show at Henry B. Gonzalez Convention Center you will find it is easier to get to your event on time if you start your trip this way. Before you leave for your trip you should go online and book your shuttle reservation, which are suggested to guarantee your ride. You can choose from a large variety of shuttle buses like stretched limousines private cars and sedans or town cars. With some many to choose from it really comes down to price and convenience. Located less than ten miles from downtown San Antonio, this unique airport offers SuperShuttle rides to its passengers. With its shared ride vans, for those looking to save a little more on their pick up to sedans, SUVs and luxury limos from ExecuCar. When you reserve your airport ride with Stone Oak Limousine they will have a driver who is very familiar with the area there to meet you at SAT airport near the baggage claim once you pick up your bags. Their services are available at all hours of the day. Rates for shuttles at SAT airport can be cheaper with shared ride or taxi services for new tourist to the San Antonio. Search and book shared ride vans before arrival for pickup and drop and fast airport transfers; our drivers are experienced locals to take you to places like San Antonio River Walk. Drivers scattered across the city to pick you up anywhere you are and drop you off to places like Brackenridge Park or the Tower of the Americas in no time at all. Turn up at your destination in style with our stylish private sedans. Book one if you want to show up and show off at locations like the Majestic Theater. Visit the famous Alamo and the Missions or the Natural Bridge Caverns with the help of local personal drivers just one phone call away. Be it the San Antonio Botanical Garden or the San Pedro Springs Park, out private SUVs transport you anywhere you want to go. High quality taxis for hire, as you seek to visit every notable place in San Antonio, ranging from the Mission San Jose to the Alamodome. Elegance and class all combined into one smooth ride! Book our private limousines and get new discounts for transportation in San Antonio. The best in the business make reservations for our buses excellent sightseeing opportunities and fast commute in San Antonio at competitive rates; visit the SeaWorld or Morgan’s Wonderland or the Steel Eel and the Iron Rattler for the thrill-seekers. Have the best possible experience you can at San Antonio International Airport by checking out our terminal map to see where all of this great airport’s amenities are located. SAT airport offers town cars, shared ride and cab rides around the downtown and local attractions. The airport has providers such as GO Airport Shuttle on site that has a shuttle leaves every fifteen minutes for the area hotels which signs are posted for hotel wait stations. Located a couple miles north of downtown and just south of McAllister Park, San Antonio International is a low-key facility offering a slew of diverse shops and eateries that not only reflect the local fiesta flare, but pleasant reputation of having the world’s friendliest locals. Explore every inch of the region with excitement, starting with exactly how you’ll get out of SAT. Go with local shuttles for something simple, or private transportation to make a memorable splash, all in efforts to arrive as easy as a hill country breeze. Give yourself a view as you make your way around, a task made easy with a taxi or group shuttle. Stay somewhere close to get a free lift, whether it’s courtesy of Staybridge Suites SA Airport or the business-friendly Embassy Suites by Hilton. For loners looking to enjoy the afternoon, book a private lift with all the freedom in the world, hopping in a sedan for a quiet drive through McAllister Park, or take advantage of a roomy SUV to take the whole family on a trip through the northwest side’s charm ranging from SeaWorld to Six Flags Fiesta Texas. Feel free to indulge with something luxurious instead, choosing between regular or stretched limousine services perfect for exploring the upscale art scene and sky-high eats offered by Tower of the Americas. If you want comfort and your own driver then a private car for SUV’s, limos and town cars may be a better option for you. The airport has several taxi companies including AAA Taxi and Yellow Cab available on at the terminals with information stations at baggage claim. There are public buses that frequent the airport across the street in front of the terminals. Maps and schedules are available at baggage claim and some bus stops and offer a list of Livery and Limo services for your needs this list changes so please check for available companies. San Antonio has thousands of parking spaces for long term and one for short term stays. 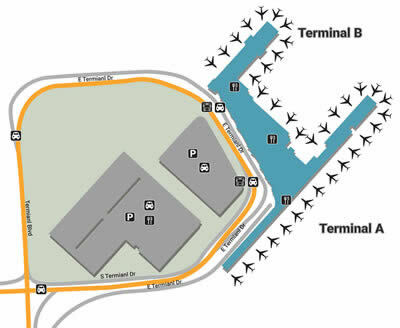 Both lots are located directly outside the terminals and designed to accommodate for handicapped passengers. Being in the heart of the city there are plenty of accommodations for all travelers. Across the street lies a Red Roof Inn and an Embassy Suites and around the corner is a Courtyard and Hilton. Some hotels offer their own shuttle services to the airport. GO Airport Shuttle provides great service for shuttles for San Antonio hotels from the airport. San Antonio offers free Wi-Fi inside the terminals tourists traveling through the airport. Wheelchair assistance is available at baggage claim for the disabled and the elderly at no additional charge. For passengers traveling with pets there is a designated place for you sit back. A multi-faith chapel is also located at the airport about forty restaurants and eateries including Alamo Alehouse full service bar inside and Starbucks for those on the run. San Antonio International Airport or SAT is complete with a wide variety of places to eat, coffee shops including a chapel inside the terminals, which for years has had tremendous ratings including their customer satisfaction. The airport is just less than nine miles from downtown San Antonio offering great memorable restaurants such as the San Antonio River Walk and much more. It is a river next to the Guadalupe River has many travelers due to the beautiful scenery and shops. If you’re looking to stay overnight in the area it offers great hotels that view the long river stretch that takes anyone on a relaxing journey, western-style. The River also offers tour boats that will take you across the river from Museums to attractions. For those looking for transportation for Henry B. Gonzalez Convention Center and University of Texas San Antonio you can take rides with your group at discount rates. At San Antonio’s theme parks you’ll find fun, family activities and attractions. If you’re looking for a thrill, drops, twists and turns or just plain fun at Six-Flags is there to satisfy. Want to take the family to an underwater adventure? Sea world is the perfect place, and how about keeping it cool on a hot summer day? Schlitterbahn Water Park is there to keep even the hottest people cool and is known to be the one of the best water parks and kid-friendly spot in the state of Texas. There is much to do at San Antonio than just to read about it, so take some time off from all that hard work and bring the family or take a date to a romantic walk or maybe just pamper yourself at many of the great hotels here at San Antonio. The San Antonio area has plenty for new arrivals coming to the city to do. Whether you are with family or on business you can find travel destinations for anyone close to downtown.